Jack Luffman says that survival is Woodhall Spa CC’s first objective this year... but he won’t rule out challenging at the top end of the table. 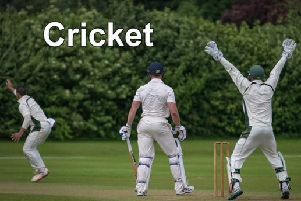 The skipper says he is envisaging a two-horse race between Bracebridge Heath and Grantham for the Lincs ECB Premier title. However, he believes that consistency will be key for any other team looking to be up there come Autumn. “I don’t think we can look any further than Grantham or Bracebridge for the league this year,” Luffman told The News. “But I think the league will be competitive and we want to be competitive as well. “Like last year, I think we’re capable of beating any team and capable of losing to any team. However, Luffman was quick to point out what his side’s top priority will be this year. He added: “I don’t want to sound boring, but the main thing is that we make sure we stay in the league, that’s important for the future of the club and the future of the players.